A unique special event took place last 2 October in one of the most important and strategic building in our country. 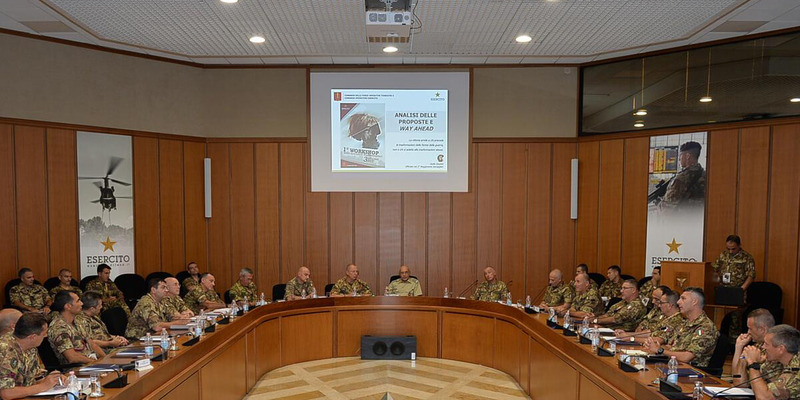 „Sala Diaz“ of Palazzo Esercito hosted the „Bersaglieri“ Specialty First Workshop, organized and led by the Operational Land Forces Command and Army Operational Command (COMFOTER COE) and attended by the Chief of the General Staff of the Army, Liutenant General Danilo Errico and 81 Officials of the Bersaglieri Specialty corps from the main Italian Army units. SISME and GML Appalti company in Aprilia, proudly designed and customized the technical system using top quality filming and audio equipment for a flawless listening experience. The facility, which was installed by the System Integrator and designed in cooperation with Sisme technical office, perfectly met the customer’s requirements looking for clear speech performances in a critical architectural environment. The system solution adopted some groundbreaking technologies which are featured in the products sold by the Italian distributor. The people in charge of “Sala Diaz” demanded extra care in the configuration and asked for a solution to a very frequent annoying issue: the variation in the audio signal volume which turns to be too strong next to the sound source and too weak in the farthest spots. The problem was solved with the installation of a ALP 8.1 column loudspeaker and 2 AIMLINE sub, (http://www.sisme.com/audio-professionale/aimline/) controlled by a SYMETRIX DSP (for preset, equalization and sub cut). The result was a perfect sound all over the room. The technological equipment included 2 HITACHI (new SISME acquisition) installation projectors which LED technology offers top performances in terms of image clearness, low maintenance cost and long product life. Special thanks to the General Office of the Chief of the General Staff of the Army for the images. Image showing Aimline ALSUB28 sub, Aimline ALP 8.1 column loudspeakers and Audio-Technica ATUC-50CU unit.